To explore the visual absurdities that exist in the imaginary world of Alice in Wonderland, ACMI (Australian Centre for the Moving Image) created Wonderland, an entirely original experiential exhibition that took visitors on an immersive trip through the looking glass thanks to the latest technology from Panasonic and creative expertise from several partners. 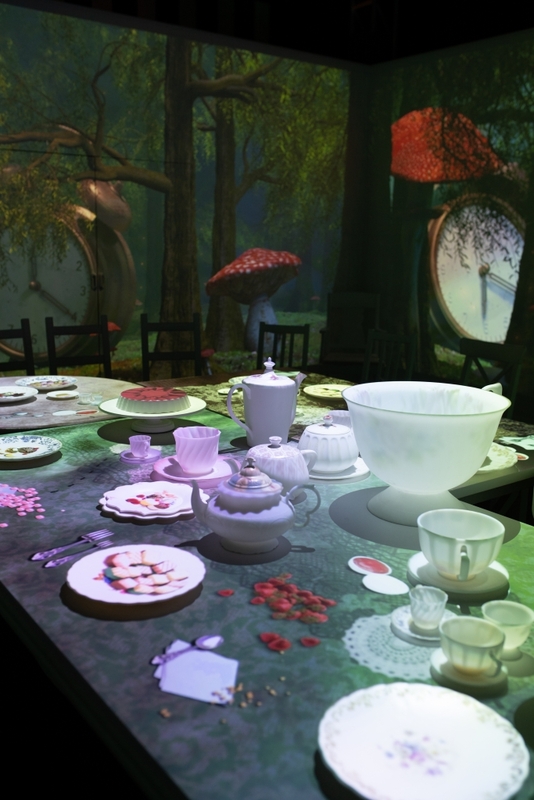 For the central exhibition showpiece, the famous Mad Hatter’s Tea Party was reimagined with a ‘digital twist’. 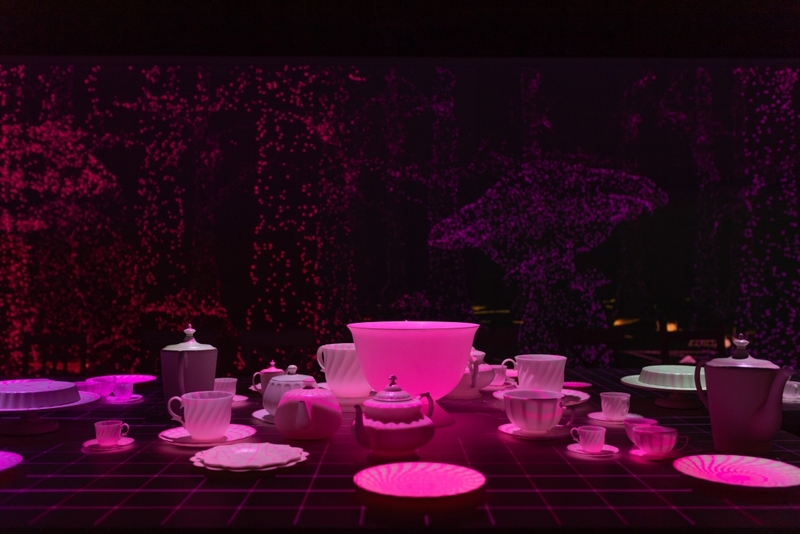 To provide visitors with unexpected content and an unforgettable experience, Panasonic solutions brought the Tea Party to life within a completely white room, incorporating laser projection and content mapping on to a table set for a tea party, and to all walls from floor to ceiling. 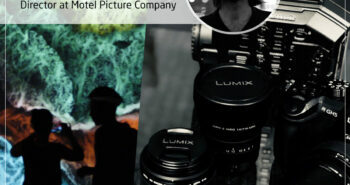 Making the impossibly magical Mad Hatter Tea Party world a reality with Panasonic laser projection technology. 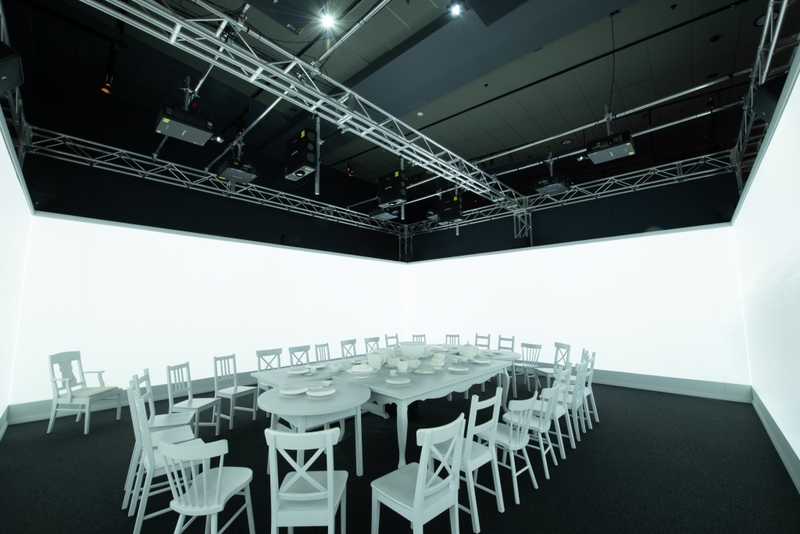 Projection and content mapping in the Tea Party room brings to life the key themes for ACMI by using technology to spotlight contemporary film making at its core. 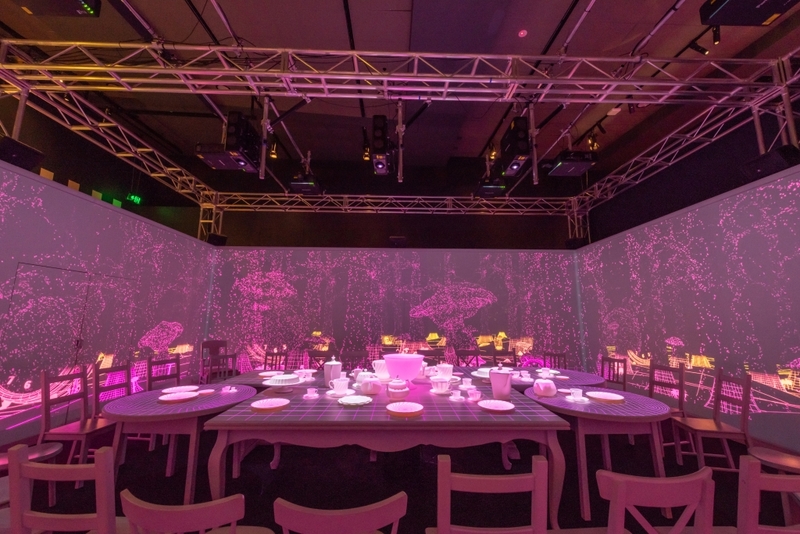 A completely white room incorporating laser projection and content mapping on to a table set for a tea party, and to all walls which ran the entire height from floor to ceiling. 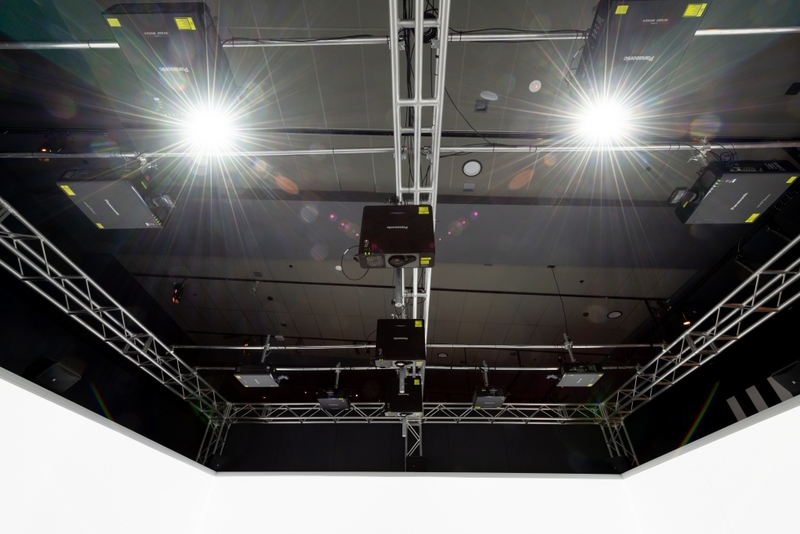 Panasonic DLP Laser projectors with ultra short throw lenses rigged on the ceiling enabled ACMI to create immersive experiences for their visitors. 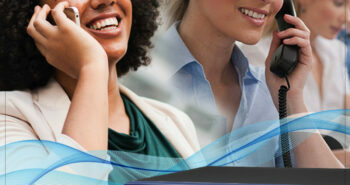 Panasonic projectors enabled ACMI to provide a visual phenomenon to create a ‘digital twist’ on this old classic. 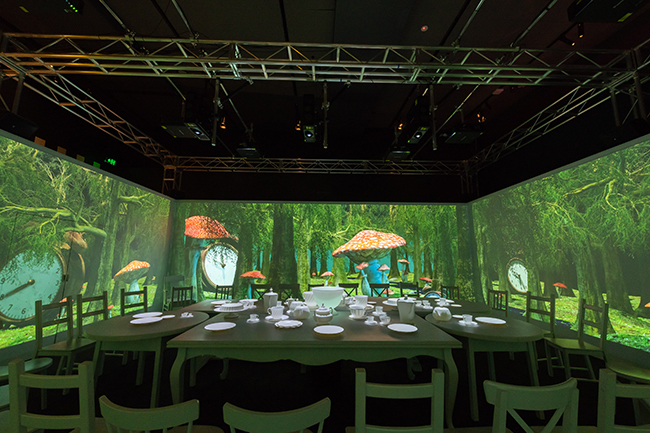 An immersive multichannel video and audio experience transports visitors down the rabbit hole into Wonderland. 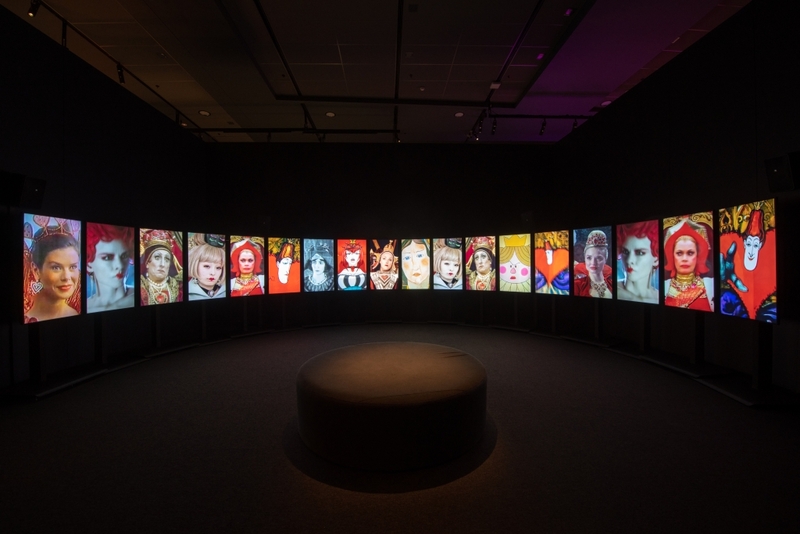 A wall of 18 x 55-inch multi video displays create an engaging experience, showcasing the history of Alice through the ages. Wonderland charted the cultural, technological and societal shifts that have compelled artists, filmmakers and fans to return to Lewis Carroll’s timeless tale again and again since the birth of cinema. So the technology used within the exhibition was critical for ACMI’s curator, Jess Bram, by allowing her to bring the classic story of Alice in Wonderland into the modern day and realising her vision with digital innovation and tailored solutions. Wondering how we made Wonderland? Panasonic is synonymous with reliability and innovation, which is why ACMI engaged us to create the tailored technology solutions which would complement Wonderland’s multi-channel video synchronised immersive experience. The exhibition illustrates ACMI’s ongoing fascination with new visual technologies and the role of the moving image to make the impossible seem possible. Wonderland is now the benchmark for innovative and creative exhibitions at ACMI, and collaborations with sophisticated and talented partners is key to the organisation’s growth and evolution.